A reminder: EIKON stands for promoting young art. This series could be continued, but we don’t want to sound like a campaign ad. Our readers already know that EIKON is all about presenting exciting new art, which especially means promoting the artists of the upcoming generation. Again and again, we turn our gaze to the art worlds of different countries, not to suggest that the world of art production is marked by borders and divides, but to discover commonalities, uncover underlying political causes, and to find artists that despite today’s international networking seem resistant to influences from the outside and force the observer to engage with the soul of the country in question. Until just recently, it was a must for many vacations abroad to bring along the pocket dictionary, because English as a global language could not yet be assumed as self-evident. But the artists of some countries and regions today demand that we approach their culture. 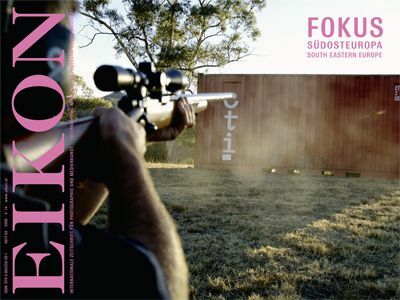 With EIKON #63, we are able to present a compendium that brings South Eastern Europe into view. By presenting this issue, the Austrian Foreign Ministry and EIKON seek to present information about the art of these countries; this has lead to a special collaboration, for which we especially thank Emil Brix and Andreas Pawlitschek, whose engagement and generous support were essential to the emergence of this issue. With Marko Lulić, we were also able to win a curator that competently took up the delicate task of selection, preparing the edition with care and tact for EIKON. The edition also includes a memoriam for Nan Hoover, the pioneer of international video and performance art who died this past June at age 77. In our piece on the Art Market, you can read about China’s new photography fair, where EIKON will also be present with a booth. The Awards section also includes the rules for the first EIKON competition. We are looking forward to receiving many submissions! If you’re tired of all the electoral politics this year, just vote for art. With EIKON you’re always sure to have made the right choice.